For decades — since about 1992 — there’s been an annual net outflow of people from California to other states. As a result, it’s always cost much more to rent a U-Haul from a CA city to some other state than to rent that same U-Haul on the reverse trip. Over the years, I’ve found that driving a U-Haul out of the Golden State can cost 2 to 4 times more than driving that truck back into CA. But now in the San Francisco region, that ratio has exploded to a 19 to 1 difference. Here’s the latest (2/2019) U-Haul figures. Kudos to Economics Professor Mark Perry for providing this information on his blog. 4. U-Haul Quotes: One-way 26-foot truck rental from San Francisco to Phoenix: $2,500 vs. one-way truck rental from Phoenix to San Francisco: $132 (see graphic above). Wow, that’s a price difference of almost 19-to-1 for the same equipment for the same number of days (4) and the same distance (about 900 miles). (In contrast, you can rent a vehicle from Hertz to travel one-way from Phoenix to San Francisco in mid-February for about $1,000 for an intermediate passenger car, $1,300 for an SUV, and $2,800 for a van or pickup truck.) 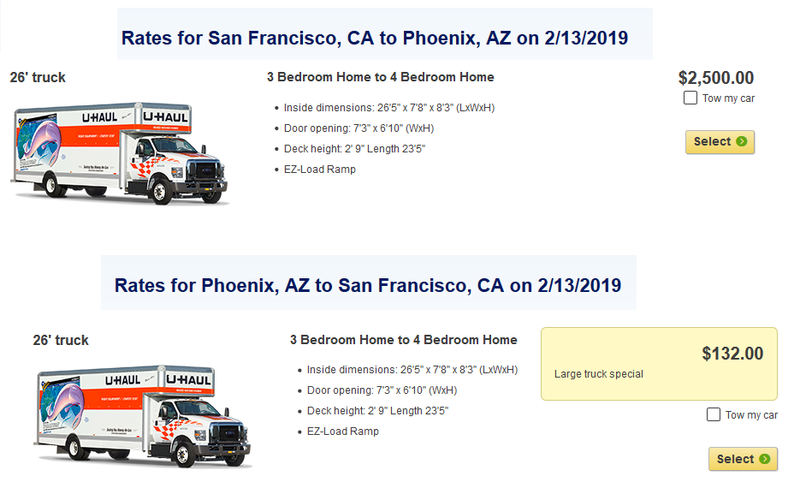 I’m guessing that there are way too many U-Haul trucks in Phoenix and way too few trucks in San Francisco, and U-Haul is so desperate to get trucks from Phoenix to San Francisco that it’s renting them for a price that is almost free ($132)! This entry was posted on Friday, February 1st, 2019 at 1:46 pm and is filed under Blog Posts.